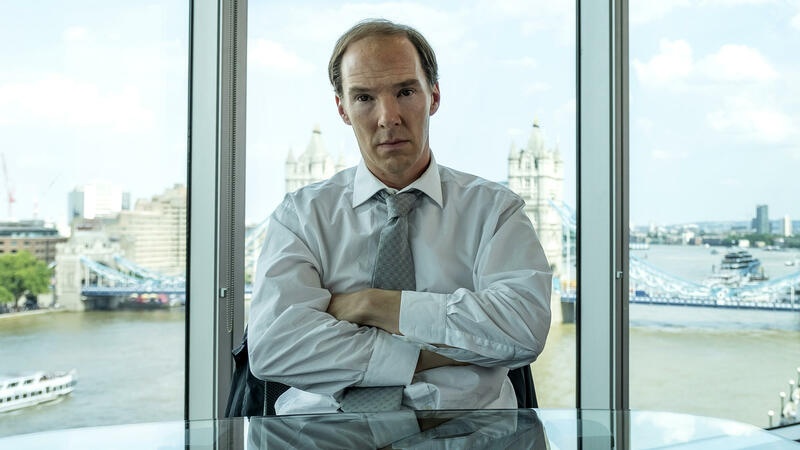 Benedict Cumberbatch plays Dominic Cummings, the top strategist for Britain's "Leave" campaign in the HBO film Brexit. It's impossible to talk about Great Britain these days without talking about Brexit, the United Kingdom's pending departure from the European Union. Of course, it's easier to say you're leaving a longtime partnership than to do it, and two and a half years after the referendum that decided the issue, what leaving means is still unknown. Just this Tuesday, Prime Minister Theresa May suffered a humiliating defeat when parliament overwhelmingly rejected the blueprint for departure that she'd negotiated with the EU. The original vote to leave Europe is the subject of a new HBO movie titled Brexit, which was made with Britain's Channel 4. Breezy, irreverent and obviously far from complete, this fictionalized piece of pop history goes behind the scenes to focus on the "Leave" campaign's top strategist, an exceedingly clever, exceedingly annoying man named Dominic Cummings. Cummings is played by Benedict Cumberbatch, who seemingly owns the copyright on men who have oversized egos to match their oversized brains. In the corridors of power, Cummings is known as one who doesn't suffer fools gladly and finds virtually everyone a fool. But he is also brilliant, which is why he was asked to mastermind the official campaign called Vote Leave. A canny choice. While the Remain in the EU campaign was run by politicos who followed familiar electoral norms, Cummings was a born disrupter, eager to take down a political establishment he thought lazy, stupid and out of touch. Creating a campaign not of ideas but of feelings, he crafted a slogan – "Take back control" – that tapped into popular nostalgia for an idealized British past that he himself didn't remotely believe in. He officially distanced the Vote Leave campaign from two notorious anti-immigrant leaders, politician Nigel Farage and moneyman Arron Banks, but he didn't try to stop them from revving up their base. Cummings' Leave campaign wasn't exactly wedded to the truth. It claimed that Britain sent 350 million pounds a week to Europe that could be used for the National Health Service – which was patently untrue – and it offered bogus scare-talk that Turkey was about to get into the EU, suggesting a million Turks could wind up in Britain. These inflammatory ideas were fanned by two star Conservative members of Parliament, Boris Johnson and Michael Gove. Nowadays, it seems to be a rule that political movies have to be jaunty – think Vice — lest the audience get bored or offended. And so Brexit bounces right along. It plays down the importance of politicians like Johnson, Gove and Farage, caricaturing them as ambitious hustlers and clowns. And it boasts another crackerjack turn from Cumberbatch whose rumpled, hair-challenged Cummings displays the cavalier monomania of one who cares more about winning than the precise consequences. You can see why former Prime Minister David Cameron once termed him a "career psychopath." When the movie aired in Britain last week, some critics groused that it diminished or simply ignored key facts, including the Leave camp's illegal donations and its racially nasty campaigning. This is quite true. Yet despite such shortcomings, Brexit is worth seeing because it captures big truths about today's politics, and not only in Great Britain. The Leave campaign was at once cruder and more sophisticated than the Remain campaign. Cruder because it played on millions of voters' xenophobia, nostalgia and genuine anger at feeling completely powerless. More sophisticated because so much of this was done digitally. Cummings signed up a cutting-edge data firm that analyzed people's Facebook posts and Twitter feeds and then flooded their social media accounts with targeted ads that played to their personal prejudices. Near the end, Cummings bumps into Craig Oliver, played by Rory Kinnear, the hyper-conventional Cameron aide who's running the Remain campaign. Over a drink — which never happened in real life — Oliver tells him that the Leave campaign is stirring up dark, dangerous forces that it won't be able to control. Cummings replies that those forces were there all along, that the elite simply couldn't see them, and that it will take a new politics to straighten things out. Watching them go back and forth, you get the scary sense that they both are right. This is FRESH AIR. In the new TV movie "Brexit," which premieres on HBO Saturday night, Benedict Cumberbatch stars as one of the behind-the-scenes figures in the 2016 campaign to have the United Kingdom withdraw from the European Union. The film got mixed reviews in Britain. But critic at large John Powers says it's an entertaining show whose themes will hit home with many Americans. JOHN POWERS, BYLINE: It's impossible to talk about Great Britain these days without talking about Brexit - the United Kingdom's pending departure from the European Union. Of course, it's easier to say you're leaving a longtime partnership than to do it. And 2 1/2 years after the referendum that decided the issue, what leaving means is still unknown. Just this Tuesday, Prime Minister Theresa May suffered a humiliating defeat when Parliament overwhelmingly rejected the blueprint for departure that she negotiated with the EU. The original vote to leave Europe is the subject of a new HBO movie titled "Brexit," which was made with Britain's Channel 4. Breezy, irreverent and obviously far from complete, this fictionalized piece of pop history goes behind the scenes to focus on the leave campaign's top strategist - an exceedingly clever, exceedingly annoying man named Dominic Cummings. He's played by Benedict Cumberbatch, who seemingly owns the copyright on men who have oversized egos to match their oversized brains. In the corridors of power, Cummings was known as one who doesn't suffer fools gladly and finds virtually everyone a fool. But he was also brilliant, which is why he was asked to mastermind the official campaign called Vote Leave - a canny choice. While the remain in the EU campaign was run by politicos who followed familiar electoral norms, Cummings was a born disruptor, eager to take down the political establishment he thought lazy, stupid and out of touch. Creating a campaign not of ideas but of feelings, he crafted a slogan, Take Back Control, that tapped into popular nostalgia for an idealized British past that he himself didn't remotely believe in. He officially distanced the Vote Leave campaign from two notorious anti-immigrant leaders - politician Nigel Farage and money man Arron Banks. But he didn't try to stop them from revving up the racists and mouth-breathers, who were their base. His leave campaign wasn't exactly wedded to the truth. It claimed that Britain sent 350 million pounds a week to Europe that could be used for the National Health Service, which was patently untrue. And it offered bogus scare talk that Turkey was about to get into the EU, meaning a million Turks could wind up in Britain. These inflammatory ideas were fanned by two star Conservative MPs, Boris Johnson and Michael Gove. Here, accompanied by Johnson and Gove, Cummings revs up campaign workers. BENEDICT CUMBERBATCH: (As Dominic) All right, team. Listen up. Now the fight for Britain really does begin. We have our star endorsements. CUMBERBATCH: (As Dominic) And we have our message. If you look on the survey, you'll find copies of the war book. Here's our message in a sheet. Here's our message in a paragraph. Here's our message in a sentence. If you find a potential voter, you hit them hard. And if it looks like they're going to bend, then you don't just walk away, pat yourself on the back. You double down. Hit them again and again, right? - with 350 million pounds and Turkey. Three-hundred-and-fifty million quid and Turkey - again. UNIDENTIFIED ACTORS: (As characters) Three-hundred-and-fifty million quid and Turkey. UNIDENTIFIED ACTORS: (As characters) Three-hundred-and-fifty million pounds and Turkey. CUMBERBATCH: (As Dominic) Again and again, show no mercy, all right? Good. Yeah. CUMBERBATCH: Go out there and do that. POWERS: These days, it seems to be a rule that political movies have to be jaunty - think "Vice" - lest the audience get bored or offended. And so "Brexit" bounces right along. It plays down the importance of politicians like Johnson, Gove and Farage, caricaturing them as ambitious hustlers and clowns. And it boasts another crackerjack turn from Cumberbatch, whose rumpled-hair-challenged Cummings displays the cavalier monomania of one who cares more about winning than the precise consequences. You can see why Prime Minister David Cameron once termed him a career psychopath. When the movie aired in Britain last week, some critics groused that it diminished or simply ignored key facts, including the leave campaign's illegal contributions and its racially nasty campaigning. This is quite true. Yet despite such shortcomings, "Brexit" is worth seeing because it captures big truths about today's politics, and not only in Great Britain. The leave campaign was once cruder and more sophisticated than the remain campaign - cruder because it played on millions of voters' xenophobia, nostalgia and genuine anger at feeling completely powerless, more sophisticated because so much of this was done digitally. Cummings signed up a cutting-edge data firm that analyzed people's Facebook posts and Twitter feeds, and then flooded their social media accounts with targeted ads that played to their personal prejudices. Near the end, Cummings bumps into Craig Oliver, played by Rory Kinnear, the hyper-conventional Cameron aide who's running the remain campaign. Over a drink, Oliver tells him that the leave campaign is stirring up dark, dangerous forces that it won't be able to control. Cummings replies that those forces were there all along, that the elite simply couldn't see them and that it will take a new politics to straighten things out. Watching them go back and forth, you get the scary sense that they both are right. DAVIES: John Powers reviewed the new HBO movie "Brexit." If you want to catch up on interviews you've missed, like our interview with John C. Reilly, who plays Oliver Hardy in the new film "Stan & Ollie," or our interview with Tom Gjelten about the evolution of U.S. policy on immigration, check out our podcast. You'll find plenty of FRESH AIR interviews. FRESH AIR's executive producer is Danny Miller. Our interviews and reviews are produced and edited by Amy Salit, Phyllis Myers, Sam Briger, Lauren Krenzel, Heidi Saman, Therese Madden, Mooj Zadie, Thea Chaloner and Seth Kelley. For Terry Gross, I'm Dave Davies. (SOUNDBITE OF MIHO HAZAMA'S "TODAY, NOT TODAY") Transcript provided by NPR, Copyright NPR.